Many homegrown Islamist terrorists labeled as "lone wolves" may not have been so lone after all, court papers filed Thursday in Virginia show. Jesse Morton, a founder of the radical website Revolution Muslim, pleaded guilty to conspiracy and two counts related to communicating threats. The charges stem from threats posted on Revolution Muslim against producers of the animated comedy "South Park" after an April 2010 episode featured a character that was supposed to be the prophet Mohammed fully concealed in a bear suit. The reference was meant to lampoon the violent reaction some Muslims have to images of the prophet. A statement of facts filed with the plea shows that Morton had contact with several "lone wolf" terrorists, and that others were subscribers to the site. 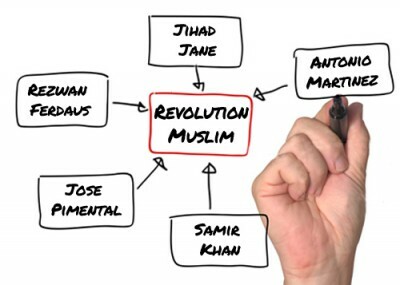 CNN, citing an unnamed senior counter-terrorism official, reported that "Investigations had revealed that Revolution Muslim was the 'top catalyst for radicalization for violence in the United States' over the last several years." For example, after one reader reached out to him last April, Morton advised him to be wary that someone helping "start a jihad group to kill U.S. Army veterans in the United States" may be working for the FBI. Jose Pimentel may not have heeded Morton's advice. He was arrested by New York police six months later as he assembled a pipe bomb in his home that he intended to use to kill soldiers returning from Afghanistan and Iraq. Morton also endorsed Rezwan Ferdaus's desire to wage jihad. Ferdaus reached out to Morton early in 2010, asking if martyrdom operations were acceptable in Islam. It depends on the motivation, Morton wrote back. "[E]very act is judged by intention and so we reserve an opinion on this matter. We can however say that these operations have apparent detractions, but also enormous benfits (sic) in a war of attrition." Ferdaus was arrested in Massachusetts last September in connection with a plot to use remote-controlled planes to fly bombs into the Pentagon and the U.S. Capitol. He also made switches to detonate explosive devices that he intended to supply to al-Qaida terrorists targeting American troops. Colleen LaRose, also known as "Jihad Jane," who admits to plotting to kill a Swedish cartoonist who drew images of the prophet Muhammad, and to recruiting people to wage terrorist attacks. Antonio Martinez, who pleaded guilty to plotting to blow up a Maryland military recruiting center. Carlos Almonte and Mohamed Alessa, who entered guilty pleas last March to conspiring to join the Somali terrorist group al-Shabaab to kill civilians "whose beliefs and practices did not align with their extremist ideology." "We may never know all of those who were inspired to engage in terrorism because of Revolution Muslim," said U.S. Attorney Neil MacBride, "but the string of recent terrorism cases with ties to Morton's organization demonstrates the threat it posed to our national security." In addition, the statement of facts shows that Morton communicated with Samir Khan, an American al-Qaida propagandist credited with publishing the group's English-language magazine, Inspire. Khan is believed to have been killed in a U.S. drone strike in Yemen that also killed American-born al-Qaida cleric Anwar al-Awlaki. Morton and Chesser also let radical British cleric Bilal Ahmad post directly to the Revolution Muslim site. In November 2010, Ahmad posted on the Revolution Muslim website praise for Roshanara Choudhry after she tried to kill Member of Parliament Stephen Timms for supporting the Iraq war. Ahmad then posted the names of all members of Parliament who supported the war, with a prayer that her actions "inspire Muslims to raise the knife of jihad against those who voted for the countless rapes, murders, pillages, and torture of Muslim civilians as a direct consequence of their vote." Morton and his colleague Zachary Chesser followed the teachings of Awlaki and Abdullah Faisal, a radical Jamaican sheikh who preached the need to kill non-believers. Faisal's sermons calling for Muslims to kill the "enemies of Islam," including Jews, Americans and Hindus, led to his 2003 conviction in the United Kingdom for soliciting to murder. Their postings on Revolution Muslim often sounded similar themes, the statement of facts said, and they republished Inspire, which contained calls to violence and instructions on carrying it out. Chesser is serving a 25-year sentence after pleading guilty to related charges. In the "South Park" case, Morton told investigators in October that the decision to post the threats was made without seeing the program. It turned out that the show never depicted the prophet, just someone in a bear suit who other characters called "Mohammed." "He said that he would have pulled the South Park post made by Chesser in April 2010 if he had known that the episode really didn't depict the Muhammad as he thought it was going to." When the show aired, Chesser told Morton that Iran's fatwa calling for author Salman Rushdie's murder following his publication of The Satanic Verses inspired radical European Muslims. Threats against "South Park's" Trey Stone and Matt Parker could have the same galvanizing effect in America. Morton also posted a threat against a Washington woman who advocated having an "everyone Draw Muhammad Day" in response to the "South Park" threats. "Morton asserted that Islam's position is that those that insult the Prophet may be killed under Shariah law just as if they were fighting with a weapon," the statement of facts said. "Morton exhorted his listeners to fight the 'disbelievers near you.'" Morton, 33, could be imprisoned for up to five years for each of the three counts in his plea when he is sentenced in May.